The Weather, Climate and Ecosystems (WaCE) Program is one of our strategic banner programs. In partnership with Fellows from PAGASA and UP Diliman, the WaCE Program will develop an approach on integrating climate information for social and ecological resilience as inputs to adaptation decision-making. The program will be pilot-tested in our learning sites in Laguna and Leyte. The second component will assess the interactions between climate and ecosystems. The poster introduces the Weather and Climate Analysis for Adaptation (WeCAnAdapt) component of WaCE. 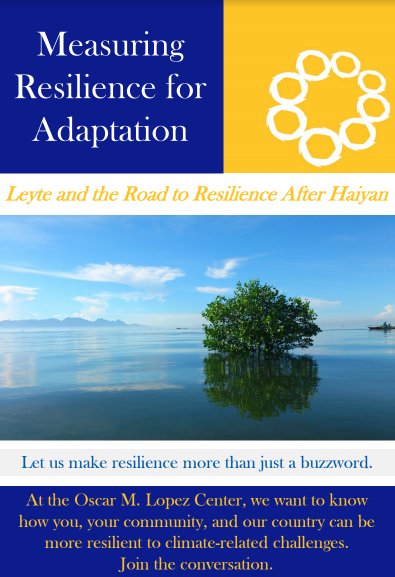 The project brief introduces the our Typhoon Haiyan follow-up study that seeks to measure the level of resilience to climate-related disasters of selected Typhoon Haiyan-affected cities and municipalities in Leyte through time and how these can contribute to the current rehabilitation and recovery and future adaptation processes.